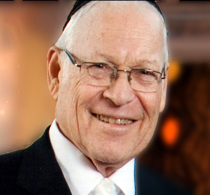 Rabbi Dr. Eli Greenwald a"h, was an illustrious and beloved rabbi, and was Rabbi Emeritus of Ohel David & Shlomo; he led the Manhattan Beach congregation for over half a century. A man who wore many hats, Rabbi Greenwald a"h served as a principal of Ezra Academy Junior High School Yeshiva in Brooklyn, was dean of Yeshiva of Manhattan Beach, was both the first vice chairman and a long term member of New York City's Community Board 15, was vice President of the Rabbinical Board of Flatbush, was a member of the Sephardic Rabbinical Council as well as the Jewish chaplain at Jefferson Medical College Hospital in Philadelphia, Coney Island Hospital in Brooklyn, and Greater New York Council Boy Scout Summer Camps. Rabbi Greenwald’s career began at a young age, when, living in Manhattan’s Lower East Side, he was one of the founders of the youth minyan at the local Young Israel. A perpetual overachiever, he received his semicha from the Rabbi Isaac Elchanan Theological Seminary and a doctorate in Jewish history and education from Philadelphia’s Dropsie Univeristy. By age 24, Rabbi Greenwald a"h found himself both married to his wife Judy and serving in his first position as a pulpit rabbi in Quebec, where he spent two years teaching his congregants not only to read from the Torah but to lead the prayer services as well. Rabbi Greenwald’s next position was in Chester, Pennsylvania where he spent the next five years, and in February 1962 he was invited to Washington D.C. to deliver the opening prayer before congress. Several months later, Rabbi Greenwald a"h received the position of rabbi at Brighton Beach’s Torath Israel Sephardic Congregation (Temple Torah Israel), the predecessor of today’s Ohel David & Shlomo in Manhattan Beach. Not only did 1962 mark the beginning of Rabbi Greenwald’s tenure with Ohel David, but, it was also the first time that the synagogue had ever had a rabbi as its leader. He delved into his new position with fervor, organizing a Talmud Torah, bar mitzvah lessons and other classes. Making sure that the younger children were an integral part of the service, Rabbi Greenwald a"h encouraged them to take on responsibilities, including reading from the Torah and leading the prayer services, assuring them that as a small family oriented synagogue, they could feel secure. Many of those children, now adults, have returned to the synagogue with their own families. As most members live in Manhattan Beach it was decided to move the synagogue closer to the community, building a magnificent new edifice nestled in Manhattan Beach on Sheepshead Bay in 1997. Now called Ohel David & Shlomo, the synagogue has a membership of over 150 families.